Half the weight and twice the power of traditional lead batteries, this workhorse gives you the perfect amount of juice for full-day adventures. 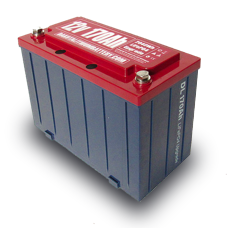 The #1 battery for fishing & outdoor recreation. The Power Box helps keep all of your electronics charged up and ready to go while giving you the freedom to use one battery to power many things. That's why here at Dakota Lithium we focus on building batteries that last a long, long time. By harnessing our unique chemistry and engineering know-how Dakota Lithium lasts 4x longer than traditional batteries, providing lasting value for our customers, and reducing e-waste and the impact on our planet. Winters in North Dakota can get cold. Up here on the great plains the landscape can be unforgiving – high winds, deep snow, long nights. Dakota Lithium was born out of this rugged landscape. A battery designed to endure. To help you do what you love longer. A battery made to last. We’ve harnessed the power of lithium chemistry and combined it with North Dakota grit to build you a better battery. To help you play harder. Go further. Last longer. No matter the weather. Get access to exclusive deals, hear about new products before anyone else, and enjoy tips, tricks, and DIY hacks from our community of experts.